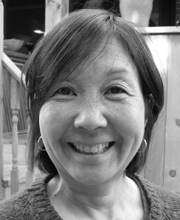 Shelley Tanaka is an editor, award-winning author of children’s nonfiction, a translator, and a writing teacher. She has been the fiction editor at Groundwood Books, a Canadian children’s book publisher, since 1983 and has edited books by many Canadian writers, including festival alumni Tim Wynne-Jones, Sandra Gulland, and Deborah Ellis. She is the editor of thirteen Governor General’s Award winning books. Her books include the YA novel, Nobody Knows, a heart-wrenching novelization of a Japanese film by Hirokazu Kore-eda, and the children’s books The Heat Is On: Facing Our Energy Problem, On Board the Titanic, Amelia Earhart: Legend of the Lost Aviator, and Attack on Pearl Harbour, to name a few. Shelley’s writing has won the Information Book Award, the Silver Birch Award, the Mr. Christie Book Award, and the Science in Society Children’s Book Award. Her latest project is White as Milk, Red as Blood: The Forgotten Fairy Tales of Franz Xaver von Schönwerth. The collection, which Shelley translated from the recently re-discovered 150-year-old German text, is illuminated with wood-cut style illustrations by award-winning artist Willow Dawson. This decidedly adult collection of stories are “darker, bawdier and racier than anything we find in Disney or the Grimms”.